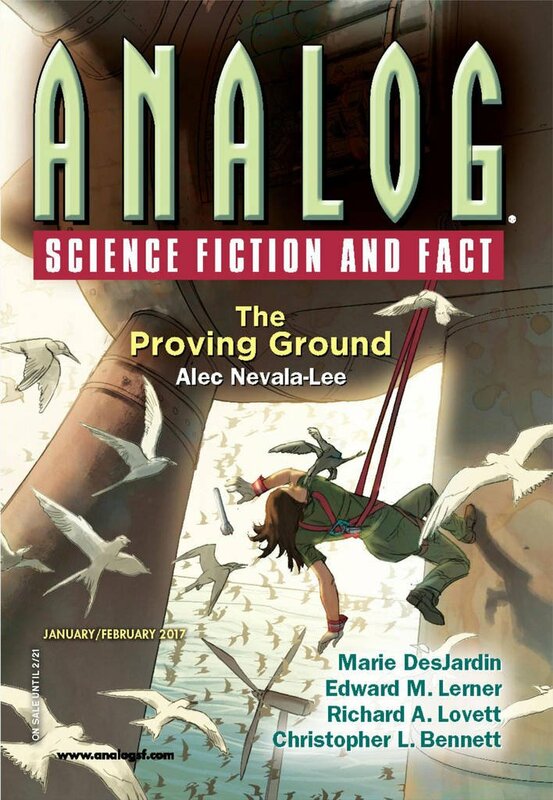 "Paradise Regained," by Edward M. Lerner [bio] (edited by Trevor Quachri), appeared in Analog Science Fiction and Fact issue 01-02|17, published on December 15, 2016 by Penny Publications. Pro: The young man and the AI succeed. Humanity will have a future on Paradise. Ironically, the choice of the colonists to change people to do less harm to the ecosystem is almost certainly going to result in them doing far more harm in the end. For an advanced civilization can afford less-damaging technologies, but a population that’s building a civilization from scratch will be far less gentle. Con: The setup is so complex it challenges disbelief. Humans imposed this genetic restriction on themselves, and it worked 100% effectively, but humans never quite died out—just hung in there for centuries. Likewise, Ship hung in there for centuries, never solving the problem until the very last minute. The narrator doesn’t really contribute much of anything to the success, other than giving an order at the end that should have been unnecessary.